As the world turns to fuel economy at the expense of driving pleasure, All-wheel drive is the 200 pound gorilla in the room. Automakers have gone to incredible extremes to reduce the weight of our cars and to change the drivetrains so they squeeze out a little more fuel per furlong. However, as all this is happening, the automakers' marketing departments, and the Northern states affluent drivers, have led a shift away from two-wheel drive to all-wheel drive in automobiles. This one option takes back most, if not all, the gains the new fuel saving technology trends offer. In the name of fuel economy automakers have removed your spare tire. That is no problem unless of course you get a flat. Then it is a big problem. Automakers have also increased the cost of building car chassis by employing exotic materials. For example GM is now using magnesium in cars again. Magnesium is a great, lightweight material that was once used in race cars extensively. Most racers stopped using it since when it burns it cannot be put out with water. Automakers have also increased the cost of your car by using a lot of high strength steel to reduce weight. Despite all these weight reducing measures, not much has changed. Due to increased scrutiny on crash-worthiness cars are not getting much lighter. The weigh saving changes above reduce vehicle weight by maybe one hundred pounds or so. Automakers have also started a bipolar shift in engine technology. On the one hand they are increasing outputs. Horsepower and torque both are going up in general, and at the same time they are using every trick they can to make the EPA fuel efficiency test think your car is a little better than it really is in the real world. Turbochargers are the main tool for both of these trends. Turbochargers are great and they can help an engine in many ways, but when the engine is downsized, and the gearing is changed to taller ratios the turbo isn’t there to help you anymore with power, it is simply there to put back what a larger in-line six (BMW) or V8 (Cadillac) would have given the driver before all the fuss. All of these small details matter a lot, and anyone shopping for a new car can see the results on the window sticker and at the pump. However, while shopping, buyers often pick one major option on many popular vehicles that negates much of this new technology designed to increase fuel efficiency. Take the New 2014 RAV4. The cute ute sells strongly, often leading the pack, and it just underwent an extreme makeover. The base RAV4 last year had an EPA rating of 22/28 mpg. Some key things the company changed to save fuel were adding a 6 speed instead of 4 speed transmission, removed the full size spare and went with a space saver (weight saver) spare. The result was a fuel economy jump to 24/31 mpg. In AWD drive versions the fuel economy was 21/27. The new 2013 RAV4 has a fuel economy rating of 22/29 in AWD form. As we can see the AWD system reduces fuel economy significantly. How much? Well, an old RAV4 with the old 4 speed and heavier full sized spare nearly matches the new AWD version in fuel economy. Why does AWD reduce fuel economy? One reason is mechanical losses. When the AWD system is actually in use (which is very rarely in normal driving) the added complexity of the drive system does use some more fuel. The second reason is weight. The RAV4’s AWD system adds about 110 pounds to the total weight of the vehicle. In a crossover the size of the Highlander the difference is about double that. The Highlander’s AWD system adds 221 pounds. Look at the fuel economy difference between a vehicle with 2WD versus its AWD version and you will generally see about a 2 mpg delta. 2 mpg in today’s world is very expensive for automakers to make up. This leads to the question of why do buyers want AWD? Subaru was the first modern mainstream automaker to make the technology a focus. Subaru linked AWD to safety, which is frankly ridiculous from an engineering standpoint. “All wheel drive – It’s all I’ll drive.” Is one marketing slogan Subaru used. In normal driving one cannot stop or turn a car any better with AWD. Starting off is definitely better. What can make a car stop and turn better, and also start off better in slippery conditions? Winter tires. Which do not increase fuel consumption and are less expensive than AWD. The next marketing push came from automakers like Audi, whose performance cars can actually make a car turn better in dry or wet conditions by turning one rear wheel faster than the other in corners. However, this effect is marginal and works best only at the limits of adhesion in hard driving. In normal driving any driver would be better off with tires that could simply increase the limits of adhesion. AWD never helps anyone stop better. 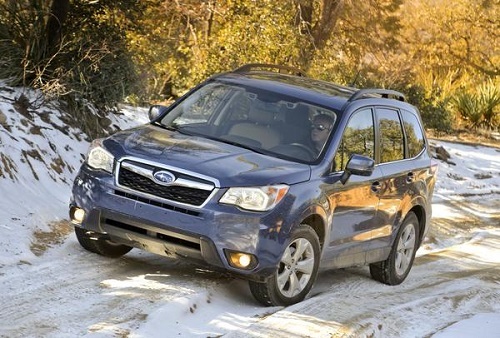 Subaru offer buyers amazing fuel economy in its Outback, Forester, and other versions of these two platforms, but it does so at the expense of acceleration. The company recently went off the reservation offering its new hot sport coupe in only rear wheel drive, which of all the possible setups is the worst in snow and rain. Will this mark a trend for industry? Doubtful. Should it? Since this is an opinion piece we will say no. Let the market decide. However, instead of letting automakers advertise their best possible fuel economy in a given model (as say Mazda does with its CX-5), maybe we should consider asking them to advertise the fuel economy of the most popular selling version of a given model, like Subaru does. The differences can be huge.